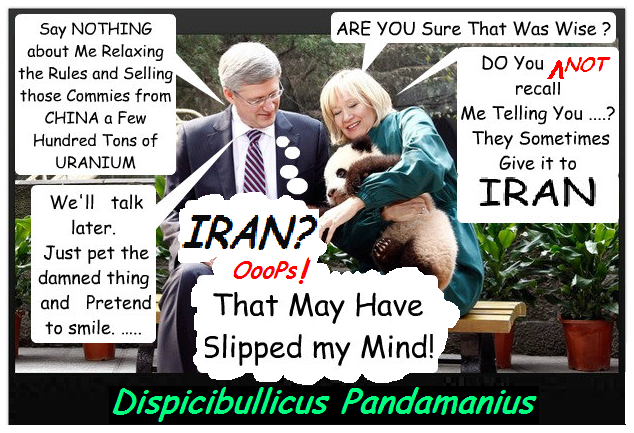 In order to get these precious Bears which I will now be calling 'Photo' and 'Opps' he Unilaterally and without consulting a Soul, Mr. Harper promised Communist China that he would relax the rules and allow them to buy 100 Tons or so of Canadian Uranium. They will not be required to inform us as to the uses of said Uranium. In the past, China has been known to give Uranium to the Government of Iran. But that, Apparently, does not Concern our "Dear Leader"
"The deal with Beijing has raised concerns in Ottawa, because it includes less stringent accounting for how the uranium is used than Canada typically demands, sources said. When Australia made a similar deal with China in 2008 that included less accountability, it faced criticism from other uranium suppliers, including Canada. China insisted on getting the same sort of accounting requirements for Canadian exports that it got from Australia. As well as using uranium for other purposes, it also has military nuclear programs, which are not subject to accounting or inspection. “The issue is requiring full safeguards, full accountability,” said Ernie Regehr, a fellow at the University of Waterloo’s Institute of Peace and Conflict Studies. In 2010, Saskatchewan’s Cameco struck two long-term deals to sell 52 million pounds of uranium concentrate to China, but had to ship uranium from other countries, such as Namibia and Kazakhstan, because exporting Canadian uranium to China was not allowed, and federal officials were uneasy with the idea of easing accounting standards to allow it. " "While the Canadian uranium deal raised questions, there are differences over whether it presents a real risk. China already has nuclear weapons, is believed to have halted stockpiling, and has shown restraint in limiting its arsenal. Of greater concern is its long support for the civilian nuclear industry in Pakistan, which developed atomic bombs in the 1990s, and whose scientists have sold nuclear-weapons technology to Iran and North Korea. China is supposed to stop nuclear trade with Pakistan, but has argued it should be allowed to continue to supply nuclear material and equipment." The new Canadian deal with China will foolishly relies on 'general assurances' that all Canadian uranium is used for appropriate civilian purposes, although Canada usually requires a more detailed accounting from customers other than the United States. Don't Worry Mr Prime Minister, They Also Eat Radicals. It's a Communist Chinese Tradition.